TopOption is a Nicosia, Cyprus based company, owned and operated by Safecap Investments Limited. Being a well-established company, Safecap is a popular name in Forex and binary trading industry. The company offers more tradeable assets than any other broker in the industry. They’re licensed to operate in Europe. It was established by experienced financial analysists that hoped to create a service for beginners as well as experienced traders. They have outstanding payouts and advanced expiry periods. They constantly improve their educational tools and provide tips and manuals to enhance the knowledge of traders. They offer live support in case of queries. Their advanced features—“Buy Out Options”, “Stock Pairs” and “Trader’s Choice” make trading safe, easy and enjoyable. They have a special resource centre where curious traders can study sophisticated trading via e-books, videos and webinars. The best part is all of this is totally free of cost. They provide a weekly market report to keep you updated. Is Top Option a Scam? Reliability of a trading platform is determined by: their website traffic data, verifying their physical location, studying their terms and conditions and checking their regulatory information. Talking in terms of operations, for any Cyprus based institution to commence trade, they need to be licensed and registered under the Cyprus Securities Exchange Commission (CySEC). Top Option is licensed under the jurisdiction of CySEC and holds a valid license number (092/08). Besides regulating their operations, CySEC offers investment compensation protection to TopOption traders. It means, should the broker become insolvent, the client can claim up to 20,000 Euros/GBP under this scheme. Since, TopOption is licensed to function in the European Market, they have to comply with standards set by the European Parliament under the “Markets in Financial Instruments Directives 2004/39/EC”. The crux of the matter is they aren’t con artists that run away with people’s money. Like many other binary options brokers, Top Option uses the ‘KeyStone’ trading software to commence their operations. Their trading software is user-friendly, easy to use and comprehensible. It works best in case of 60 seconds options and Call/Put that offer swift returns on your money. You can also test your luck in strategix trading, pro and above/below options. When commencing a trade on TopOption, you can monitor active trades on the trading charts available at the centre of the screen. You don’t need to download any data because all information is available on the website itself. The personal details are SSL encrypted to prevent third party hacks. Top Option offers 5 types of trades. The most popular trade that lets you predict the future price (high/low) of the options after expiration of trading contract. Short-term trades that get processed within a minute. They’re best alternatives for impatient traders who want swift returns. If your trading prediction turn out to be correct, these trades provide you profits as high as 500%. A ProOption Trade is relatively new in this field. In this case, traders select between two types of assets and face them off when processing trades. This type of trade lets you exercise control on various trading aspects. They let you modify percentage returns by determining risk-reward ration. Thus you can influence the trade expiry outcome, as per your own will. Top Option lets you choose among 180 assets on their trading portfolio—one of the most comprehensive portfolios in the industry. Strategix is a self-designed tool for market analysis that facilitates advanced binary option trading and quick trading. The minimum deposit value is 100 Euros. 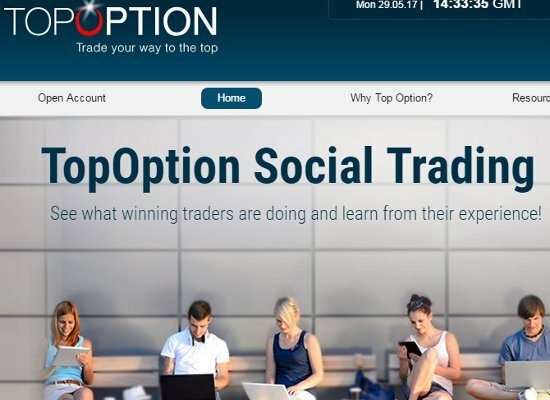 Being a CySEC-regulated broker, Top Option no longer provides bonuses on binary options trading. Nevertheless, you can always request up to 25% amount on initial deposits (subject to a maximum value of £2500). This bonus may not be beneficial for you as it restricts your trading by attaching specific terms and conditions for withdrawal. Mobile trading is available but we didn’t find much details on their app. The website offers 3 types of trading account. No fees, Custom-tailored stake sizes, minimum deposit value is 100 Euros, Protected under investor Compensation funds, Risk management Tools available. All benefits of starters account included, Access to Strategix tool, Regular newsroom updates and alerts, Minimum deposit value is £ 1000, 24×5 live support, Extensive Material in the e-video library, 1-on-1 introduction to binary trading. All benefits listed under a pro account, 1-on-1 trading tips for 3 hours, Advanced e-video library, Minimum deposit value 5000 EUR Expert account manager, Professional Trading platform and Faunus report available. All their funds are safely held in various banks of Switzerland, UK and Germany. Though payout depends on the nature of trades, their average payout% is 85. However, it can go as high as 500%. Not many people know that Top Option is MiFID compliant. The MiFID aims at harmonising the regulatory framework of various financial services within Europe by setting up minimum fiduciary duties for individual financial providers in Eurozone. Demo Account or practice account minimises the risks in trading, as traders use virtual money for learning purpose. Unfortunately, the website doesn’t provide any such provision. Top Option is available in Australia, Austria, Belgium, Cyprus, France, Netherlands, Spain, UK and a few more countries. Each country has a specific dedicated helpline for itself. Other than being a new broker in the town, Top Option hasn’t provided much information on their office address or company. Though, they’ve provided a list of hotline numbers for various officers. Traders can contact their home branch on these numbers. After studying all the advantages and disadvantages of Top Option trading platform, we conclude that it’s worth a chance. Any trade who’s interested in acquiring information on options and wish to trade with a CySEC regulated broker may consider it. Since, Europe has already tightened the noose around brokers in Eurozone, Top Option is among those few brokers that comply with MiFID standards. In short, you can conduct risk-free trading with Top Option. Nadex or North American Derivatives Exchange based in America, is a CFTC certified binary options broker run by IG Group. IG Group is one of the leading providers of CFD, BO and Forex trading since 2004. The company offers up to 5,000 contracts for trading including a wide range of indices, commodities and currency pair that you won’t find anywhere else. Based in Chicago, Nadex is easily distinguishable from other foreign-based brokers in binary trading. The difference between a broker and a trading exchange is that brokers set their odds within a cramped office whereas sellers and buyers deal in market-based prices when working in association with the exchange. Considering this point, be assured that you’ll get a fair, risk-free, transparent deal as compared to other traditional brokers. Though exchanges impose transaction fee on trading, you can get a detailed list of available contracts, their strike prices, expiry time, specific pay off ratios, OTM (out of the money) option, risk/reward ratio and other details. The winning payoff is estimated as $/€/£100 and you can easily calculate individual rations by calculating the differences. One thing that distinguishes Nadex from other brokers is that it offers Spreads. Another good thing is that risk parameters are preset before you execute your order. We don’t think so, as they’re listed on the LSE (London Stock Exchange). The company has its headquarters in Chicago and are owned by IG Group. It’s a UK based derivatives trading company, which is a part of FTSE 250. Their Market Capitalization is £2.9 billion, as calculated on 31st May 2016. The company is authorised by the CFTC (Commodity Future Trading Commission), which makes its operations legal in America. They have a valid geographical address: 311, South Wacker Drive, Suite 2675, Chicago, Illinois, Pin code 60606, as published on their website. Their customer service representatives are easily reachable on customerservice@nadex.com, toll free (977 776 2339) and International helpline numbers (+1 312 884 0100), which pretty much certifies its authenticity. Besides, their trader funds are safely put into Fifth Third Bank or BMO Harris Bank, which is why Nadex is the best binary options exchange for traders, especially those who’re Americans. Nadex is nothing like SpotOption—the primary trading platform provider in the binary options industry. It’s because it is not a broker and their trading software is specifically designed to meet the trader’s requirement. You should brush your skills on option contract before you proceed on with real-time trading. The proprietary design beautifully displays all option contract with fixed rates and possible risks, before you execute your trades. The charts display real-time profit and loss and tips on managing options before they expire. A Finder window on the left allows you access to asset type and their expiry. You can check their prices and choose your assets. Nadex has set 10 price levels for your assets—based on the closing price. The settlement price on its binary options is 0 to 100, where 100 denotes a positive outcome and 0 represents a negative outcome. As a trader, you can sell or buy both negative as well as positive outcome. All details related to your trading contract (such as price level, expiry time, current bid, bid size and offer prices) are available on the trading ticket that also highlights maximum payouts and maximum loss risk. On a positive note, traders can alter their trade prices. Traders can open or close their trades at any time—thus gaining profits and reducing losses on trading contracts. Other than dealing in commodities, indices and forex pair, Nadex also deals in events, for example a fed fund rate rise. Total of 500 contracts are listed under it, which makes it favourable. Nadex does offer bonuses, but not as cash and incentives due to CFTC regulations. They offer fee free trading and commission-free trading days because they would rather want you to trade in an exchange because of your own will, not because they’re offering a tempting bonus. Nadex’s mobile app is one of the best, most competitive trading apps available in the market. The free of cost application is optimised for different platforms—iOS and Android as well as for windows phone. With a clear layout and easy-to-access interface, the app leads the way in binary options. Its operations are quick and slick. The best thing is that every information available on the website is available on the mobile app too. From trading to charting, account management and trading area—the app is certainly useful for traders. The company offers a single account for both domestic as well as international clients. Their demo account is loaded with $/€/£25,000 (virtual money)—both accounts accessible via mobile apps. Payoffs vary, based on strike price for different OTM options, which permit as high as 100% payout on 7 commodities, 10 currency pair, 3 events and 8 indices. The exchange imposes a nominal transaction charge on each contract– $0.90 per contract and $/€/£9.0 per side. Payouts can be cashed in through paper checks, wire transfers, ACH transfers and debit cards but you need to provide your AML/KYC ID before making withdrawals. All withdrawals are processed via the US Automated Clearing House system, which take up to 2 days to process. Since Nadex headquarters is based in Chicago, their operations fall under the jurisdiction of US laws. All information pertaining to their license can be located on their website. Nadex offers a single account that automatically ropes in a free demo account. The account offers you access to multiple webinars and videos to help you grasp the basics of trading. One thing that distinguishes it from other exchanges is their trading style that fluctuates between executing binary options and real options. 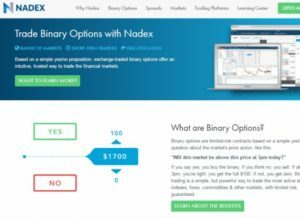 Though Nadex may not offer you all the perks associated with binary options, as in the case of other brokers, but the good thing is that you’re in control of your accounts, not the exchange. The website offers its services mainly in US and UK. Talking in terms of global binary option, Americans are usually restricted by local laws, but not Nadex. Since the exchange is owned and managed by one of the largest derivative trading companies in the world, you get a safe, fair and transparent trading experience where you are the one in control. You can willing buy or sell options, set your own risk and reward parameter and access trades your own way. There are extensive educational materials, guides and free demo accounts to help you. Quick returns make it all the more promising. The only restriction is transaction fee that applies on various conditions. Overall, it’s an interesting place to try your luck at. 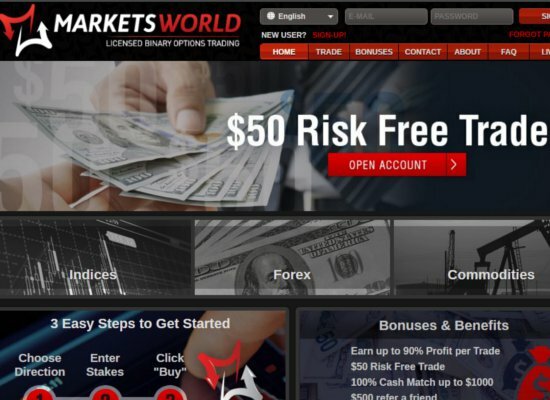 Launched in 2011, MarketsWorld is a reputed broker in binary options trading, regulated to operate in Great Britain. It is licensed as a broker to operate in the Isle of Man—a fact that guarantees safety of your funds. We have followed MarketsWorld closely for several years. Our findings reveal that the company holds a solid reputation in the market. Flexibility in terms of trade size, low deposit amount, demo account registration and tips/articles on binary options are some of its most distinguishing features. If you have any queries regarding trading, you should take a look around their website before you indulge in live trading. Reach out to their customer service at: +44 (0) 1624 678 022 or service@marketsworld.com. US traders are allowed to try their hand at binary options trading. Before that, check out our findings on Markets World. No, we don’t think so. Marketsworld has been in industry since last 5 years. They have their assets spread over a large category, including commodities, currencies, indices and stocks. They deal with trusted banks and finance partners. Besides these, three important facts denote its credibility. They hold a valid license endorsed by the UK trading association. It means all transactions falling under MarketsWorld are subject to jurisdiction under Isle of Man GSC. Isle of Man is quite serious when it comes to issuing license. They have laid down legit parameters for various companies to qualify for registration under UK laws. They let you test your skills through a demo account, which doesn’t require you to deposit real money. If you check out reviews on the internet, you’ll discover that Markets World has received high ratings and positive feedbacks. All in all, we’re pretty much confident that they aren’t scam. Account registration is a simple and easy process in MarketsWorld. Once you’re registered, you can trade up to $/£/€1000 in Euros, British Pound and US dollars. The trade markets cater to different types of binary traders. You can add or withdraw funds to your accounts using different debit/credit cards (Visa, Maestro or Mastercard). The far-reaching MarketsWorld’s platform gives you an opportunity to hone your skills. Coupled with excellent bonuses and the golden opportunity to earn about 95% profit per trade, it’s understood why their website is immensely popular among traders. 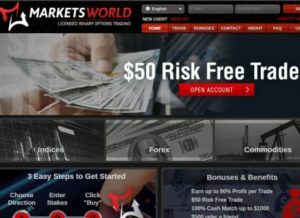 Although Marketsworld has a number of attractive bonuses to its name, but the real bonus is that they offer money as rewards on trading. This means your winnings are held in to your account until you trade 50 times of your winnings. Besides this, there are ‘Fixed deposit cash match’ (100%), $/€/£50 Free Trade, $/€/£10 ‘No deposit Bonus’ and several monthly rewards program to keep you coming. If you refer the website to your friends, you’ll get up to $/€/£300 on your trade. To let traders access their trading platform anytime anywhere, Markets World has launched their personalised app. Markets World mobile trading app is compatible with both iOS and Android platforms and offers a seamless trading experience 24×7. The app occupies just 24 MB of your space—a solid addition to your trading experience. In case you have a demo account, you can operate it via desktop browsers and mobile apps. You can get demo account and live trading accounts. If you’re seeking risk-free opportunities in trading, you better start with a demo account. Once you grasp the intricacies of trading, you can move on to live trading account. The charts display fonts in smaller size. Once we place a trade, the system runs a countdown before it’s placed. We don’t find the logic behind waiting for 14 seconds because one can’t cancel the trade in that time. Also, the customers need to wait up to 3 minutes after option expiry to find if their option is OTM or ITM by nature. On a positive note, MarketsWorld doesn’t charge any fees or commission or deposits and withdrawals other than a wire transfer (available once in a month) when the site charges you $50. The average payout rate is 90%, but it isn’t applicable to all assets. To top it, the website people don’t offer any OTM refund. In order to open a demo account, one doesn’t need to deposit any money. Demo accounts provide you access to all the underlying assets available at same prices, without risking actual money. The account doesn’t have any time restrictions. If your demo money wipes out, your funds can be reset. The idea behind this account is to develop confidence in traders before they venture out in the real field of online trading. However, once you open a real account, the demo account becomes void. Markets World usually caters to the requirements of customers in Euro zone except those countries where trading is barred by laws. The website is available in 9 languages—English, German, French, Spanish, Italian, Russian and three more. An easy to use interface, 100% free no deposit demo account, forum for help and a responsive customer team is what makes us recommend Markets World. They copy online casinos amazingly well. The glamour is visible as soon as you enter the website and see big guns, limos and supercars coming your way. Help is available 24×6 (except the time when site is down for technical maintenance) on Email, Skype, Telephone and live chat. You can access customer forums to improve your trading experience with clients. The site may not have a repertoire of trading tools, but fast execution and accuracy of trading quotes distinguishes them from rest. Marketsworld is a safe, reliable, licensed binary options platform for newbie. Slow processing of trades and the fact that they deal in short term/intraday and high/low option may restrict traders. Upon checking complains registered under Markets World’s name, we came across clients who’ve complained regarding manipulation of prices but there aren’t any evidences to support their claims. Most complaints are on the limitations of its platform, but not on bonuses, withdrawals and useless signals. Overall, it’s a great place to test your skills. 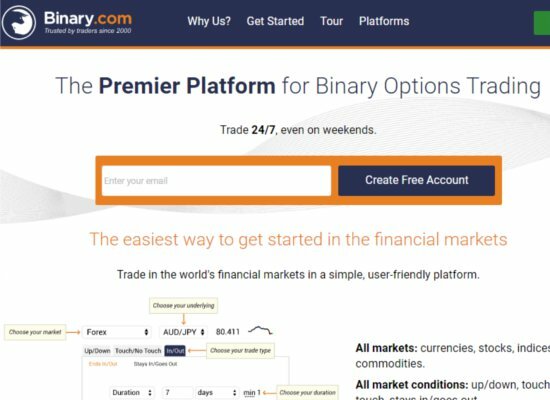 Binary Mate—a US based binary options is relatively new in the market. The company opened back in June 2016. It’s owned by Affort Projects S.A.. Its office is based in Albert Street, Victoria in Seychelles. The company offers a demo account for first-time traders so they can try out their trading platform. There are multiple banking options for depositing or withdrawing money—resulting in satisfied customers. We explored different features of Binary Mate to summarise their key features. Here’s a brief insight into Binary Mate trading features, platform, bonuses and banking methods to help you establish your roots in the trading industry. Besides being a-year-old company, there’s nothing shady about Binary Mate. The company has published its valid address on website. Other than this, you can reach their customer support team on (829) 954 8077. The company is licensed and regulated by CySec Europe. 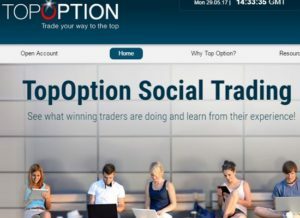 They use SpotOption trading platform and auto trading software designed by BlackBoxRobot.com. Secondly, their online website receives high traffic, which again certifies their credibility. 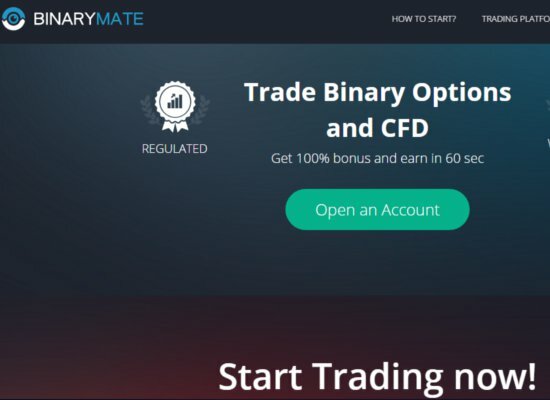 Slick, simple and uncomplicated—that’s what Binary Mate’s trading platform is all about. Simplicity is what distinguishes Binary Mate from other trading platforms. Their trading charts include all information about placing trades, including a clear visual/dashed lines and expiry time. The graphs are regularly updated to highlight price changes. Traders can open multiple trades on a single chart. You can access details on underlying assets and their expiry period using a simple drop down menu. A separate section has been allotted to different trade sizes (top right corner of the website). The bottom right section has been allotted for payouts. Other than these, there’s a sentiment bar for forecasting. Overall, the trading platform is comprehensible and user-friendly—something that attracts customers at the very first instance. At Binary Mate, traders can trade in limited assets, such as indices, stocks, commodities and currency pairs. Binary Mate trading software is dynamic in nature, including up-to-date market movements and a private chat window where you can share your queries with expert traders. Though they offer limited trading options (60 seconds, High/Low and Long-term trading), all information is easily available on the desktop. Users don’t need to download anything—the best feature so far, if you ask us. Don’t forget to check terms and conditions associated with the bonuses. Luckily, Binary Mate offers an easy-to-use mobile app designed for both iOS and Android platforms. Trading on mobile app is similar to trading on other platforms (the version functions just like any normal desktop browser). To our surprise, the application lets trader execute trades instantly, manage account and access full trade history and charting tools. This puts Binary Mate at a stronger position compared to its rivals. Bronze, Silver and Gold account types each has a unique set of benefits associated with it. There are specific set of requirements for each of them. The risk-free trades offered by the owners are compensated as trading bonus, if you end up suffering losses. However, there are specific conditions associated with trading protection cover and bonuses (you need to check conditions mentioned in the user agreement before trading). The maximum turnover associated with each account is 20 times in case of ($$/€/£100,000) and 3 times for regular deposits. All additional deposits must be turned over before you withdraw your winnings. Average payout percent on trades is 90% to 92%. The rates fluctuate based on asset type and expiry period. The rates are better, as compared to their rivals. The owners boast the swiftest payout processing time in the history—1 hour, which is a plus point for owners. To access the benefits of trade account, users need to complete the verification process to avoid any delays. The good thing is that website gladly accepts a range of e-wallet services, wire transfers, credit/debit card, web money and cryptocurrency (Bitcoins). You need to withdraw minimum $/€/£50 at a time. Make sure that you’ve thoroughly inspected the turnover requirements before making any withdrawals. All operations fall under the jurisdiction of American court. Binary Mate does offer a demo account, just like other brokerages. However, not much is known about it. You can get complete information on demo account only after you register on their website. It’s something very common because most brokers require you to register on their website before they offer you a demo account. The downside however is that Binary Mate demo accounts come with restricted trade limits. Each account holder is given virtual funds worth $/€/£250—imaginary money to set your mood in trading. They also conduct binary competitions where you can sharpen your skills before trying your hand at real-time trading. As of now, the website operates in US, Asia and selected countries only. Despite being the new guy in town, Binary Mate is one of the preferred choices of traders around the world, the reason being that it supports multiple languages. Their trading plat form is easily navigable, intuitive and traders are offered 24×7 live support. In case you have any queries, you can check their FAQ section for more details. The only shortcomings are they haven’t listed their license details on their website. Besides there are complicated conditions associated with the bonus. Other than this, the website is a fine choice for traders. Formerly known as BetOnMarkets, Binary.com is a fixed odds financial betting broker existing in the market since 1999. The brokerage company is based in Isle of Man and Malta. Owned and Operated by Binary Ltd, the company serves approximately 1,000,000 clients till date. All their operations fall under the jurisdiction of Malta. The main feature of Binary.com is its versatile, proprietary binary options trading platform based on the typical broker trading interface—crucial for trading. Their website provides truly useful input to trading. Their trading platform is good in terms of trading but doesn’t have advanced tools for analysis. No, we don’t think so. Being one of the most respected, multination corporations in trading, we don’t think that binary.com is a scam. All their operations are subject to the regulations of Malta and the Isle of Man. Traders can rely on the authorities to protect their legal rights. If we check their website traffic history, we’ll find that the website receives huge traffic (up to 1.7 million until January 2017), which denotes they’re a legit business. The trading platform of Binary.com is different than other regular brokers. It has a deceptively simple interface with all basic functionalities. If you scroll down their home, you’ll find comprehensive charts and daily/intraday prices displayed on various tabs. The prices are accompanied by quotes and percentage change—something which is quite useful. Traders predict prices to end up lower or higher than the predetermined prices. The expiry price of a commodity is expected to fluctuate (rise or fall) from its current spot price. Payouts are made when trade prices touch or don’t touch a preset price target. The prices fluctuate between two price targets. You need to see in between or out of the price range. Tick trade further covers—Lucky 10 digits, Quick 10% and Up/Down Traders. They work similar in case of 60 seconds options where the prices go in ‘5 ticks of price movements’. Binary.com trading software deals in wide-ranging assets, such as Indices, stocks, forex and commodities. They also deal in Quotidians and Random Index market. Marked by a strong support system, the company people are available 24×7 from Monday to Friday. You can learn more about the trading software by calling, dropping a mail or chatting with the customer support team. Binary.com follows a different strategy compared to other websites. The selection of expiry time is a unique process. 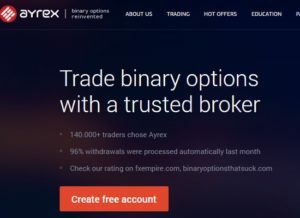 Both the trading software as well as the platform offers great flexibility in terms of contracts and their expiry perhaps this why brokers favor binary.com. The firm delivers a range of advanced platforms (based on binary bot, MT4 and MT5 trader tools). The site offers unconventional bonuses to binary brokers, which are also available for new traders that register their brand new accounts. The bonus value differs from time to time and so will the trading volume. As of now, the site offers 2 types of bonuses. Deposit Bonus: Which will be added to your account once you reach a turnover of 5 times bonus. Only then can you withdraw it. Free Bonus: It is available to new clients only. The maximum value offered under the ‘welcome bonus package’ is £ This type of bonus requires a turnover of 25 times before you can finally withdraw it. Both offers contain specific terms and conditions attached with them. Both Demo and Normal trading accounts are available in case of binary.com, which is a good thing for new traders. Clients can start try their hand at virtual trading by opening a demo account and dealing with virtual money. Usually, many brokers require you to login and deposit money into your account before you can access their trading platform, but not them. Once you’re comfortable with trading practices, you can open a live trading account by providing your details, getting account verified and depositing money in Euros, Dollars or Pounds. Binary.com offers a strong mobile app—a unique trading platform optimized for each device and operating system. It maximizes your abilities and lets you access trading platforms anytime anywhere. The app is compatible with Android and iOS platforms. The payout percent on trade varies from 60% to 110% (yet another distinguishing feature of Binary.com), based on what type of contract you’re dealing in. Check trading platform to find the current payout rate on the right side. The ratios fluctuate according to changing market conditions. Binary.com has strict regulations regarding assets, expiry times and returns. When trading, the customers can choose between 29 indices, 30 currency pairs, 5 commodities, 41 stocks and 10 volatility indexes. The expiry time of these assets is well defined under ‘Asset Index’. Traders don’t need to pay any commission when opening account, except in the case of Tick Trades, where the commission is 1.5% on payout. However, it’s easy to get high returns (as high as 90%) on your trades. In some cases, tick trades offer greater returns (over 100%). Deposits can be made using e-wallets, credit cards and debit cards. The minimum deposit value is £10—a fair amount to start your trade with. The platform is intuitive and available in 12 different languages. The main language for charts and market analysis is English. The website offers a demo (free virtual money account) for first-time traders. Due to legal restrictions, the website doesn’t extend its operations to Hong Kong, US and Costa Rica. Why do we recommend Binary.com? We recommend Binary.com because it has simplified the process of account opening for its clients. With its unique trading platform, advanced charting tools and long operational history, the website gives you the peace of mind to trade with an open mind. The website shares similar characteristics with a betting company. We aren’t against trading but gambling is different from trading and it should be kept like that. Talking about customer service, it is quite slow. However, things have significantly improved since BetonMarkets. We look forward to see more changes in the future. Founded in 2014, Ayrex is an innovative broker in binary options, located in Nevis, St. Kitts and Charlestown. Initially, the company was registered as ‘Advanced Binary Technologies Limited’ (Registration no. C44622), but it later switched to its new name ‘Ayrex’. 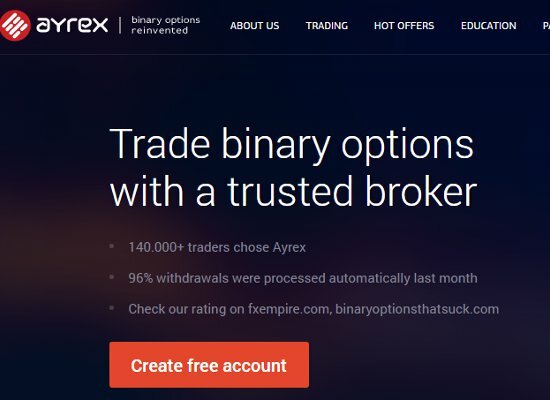 For a company that was founded just 3 years back, Ayrex has earned a reputation as a safe, professional and transparent broker in the online trading industry. The company is client-oriented and quite responsive to the requirements of their clients. Ayrex isn’t a scam for sure. The company has published its contact details and verified geographical address on their website. According to the information, they’re based in Office 590, Suites 5, Horsfords Business Centre, Long Point Road, Charlestown. Moreover, their customer support team is reachable on support@ayrex.com. They also have a live chat option that works 24X5 (on weekdays), highlighting the ‘transparent’ nature of their business. Besides, the company is regulated by CySEC and supported by the members of CommuniTraders forum. The company is up front about their business model and have clear terms and conditions with no strings attached. Website analysis reports of Ayrex reveal that their company has received a steady traffic over the years. Most of the traders visiting Ayrex are from United Kingdom (6.7%) and South Africa (19.70%). Healthy web traffic denotes their credibility and solid market reputation. Keeping the aforementioned points in mind, we conclude that it’s safe to deal with Ayrex. Unlike other brokers that work on SpotOptions trading platform, Ayrex has its personal proprietary trading platform that offers a fulfilling trading experience for new traders. The plus point of a custom-tailored platform is that it eliminates any delays in processing trades. With a slick user interface, trades are just a single click away. Ayrex’s online platform is ideal for swift trading, especially for 30 seconds or 60 seconds options. Their user-friendly trading platform provides you quick access to the trading screen, user manual and a free demo platform where you can test your skills. One thing that differentiates Ayrex’s trading platform is “Early closure” feature. This feature lets you close trade before its expiry time. The trades are limited in number, but their quick processing time makes up for this loss. Why you Should Open an Account with Ayrex? Though unregulated, Ayrex goes great lengths to prove its reliability. It meets all standards set for a regulatory agency to operate in a transparent, ethical manner. It has proven itself responsive by handling customer queries. Facts state that Ayrex has submitted its application to relevant authorities for monitoring. In time, it’ll become a regulated broker like others. Ayrex is known to offer a no deposit bonus worth $/€/£30 that can be traded by traders. You can withdraw the winnings generated from bonus after you’ve reached the $200 mark. Other than this, Ayrex also offers a deposit bonus ranging from 10% to 30%, depending on the amount deposited. Ayrex was one of the first brokers to launch its personalised Android application for portable devices in the beginning. The app works seamlessly for demo as well as live trading accounts. The clarity, efficiency and precision of Ayrex’s mobile trading platform are a few features that set it apart from others. Your mobile app is synchronised with desktop data. You can easily switch between real and demo account. In case of Ayrex, your trading choices are restricted to Standard Trading and Islamic type trading. Ayrex is clear about its terms and conditions, when it comes to opening an account. The minimum initial deposit is 5 USD/GBP/Euros. There’s no limit on maximum deposit value. The platform offers different bonuses to encourage traders. If you deposit $$/€/£100 to $/€/£499, you’ll receive 10% of the total deposit as bonus value. If your deposits fall within the $/€/£500-999 mark, the bonus value ranges from 10% to 20% (check terms and conditions for more information). For deposits above $/€/£1000, you get up to 30% bonus. The demo account works just like normal trading account, but with virtual money. It’s there to help you test your skills. As for underlying assets, Ayrex offers around 50 assets ranging from commodities to stocks, indices and Forex (currency pairs). Ayrex offers standard payouts (which go as high as 89%), though the average value fluctuates within the range of 80% to 83%. Trades that close out of money don’t get rebates. Ayrex’s application for regulation is under assessment by the regulatory bodies. Demo account is available for new traders (Check terms and conditions for more details). Ayrex accepts traders from the United States, United Kingdom, Syria, North Korea, Iran, Iraq and many other countries around the world (except those where trading is illegal). Active on social networks (Facebook, Twitter and Google+) where owners public trading tips and latest happenings on their web page. Why Ayrex is different from other Brokers? Many trading houses and brokers have surfaced in last couple of years, most of them being nearly identical to each other. In such a scenario, Ayrex’s new innovative trading platform is a refreshing change for traders. Their well-defined trading policies and ‘transparent’ operations make them superior to other trading platforms. Other than the fact that it isn’t regulated yet, it’s safe to trade on Ayrex.